Daily Dose: Dommengang, "Past Lives"
It’s an unfortunate punchline that most of the folks working behind the counters at coffee shops around the country are struggling artists of some sort. That may be the case, but shouldn’t we be celebrating their work and their after hours and weekend efforts to create rather than looking down our noses at them? That’s the sentiment behind both volumes of Stumptown Coffee Worker’s Comp collections. They know that they have employed and will continue to employ musicians of all stripes, and are choosing to highlight their sounds and share them with the rest of the world. The first volume of this series came out in 2001, with the bands featured on it (including 31 Knots and proto-Thermals project Urban Legends) recording after hours at one of the coffee company’s shops in Portland. Now that they’ve expanded throughout the U.S., this new edition features artists from around the country who were all flown to Portland to record some tunes with producer Mike Coykendall (M. Ward, She & Him). True to the spirit of the many people under Stumptown’s employ, the sounds vary wildly from the stomping folk-pop of MIdnight Calls to the dusted electronics of Jihaari Terry to the ‘70s rock swagger of the artist we’re featuring today, Dommengang. The L.A. trio recorded a perfectly boogied up slab of rock that is a nice continuation of the material found on their recent Thrill Jockey release Love Jail. 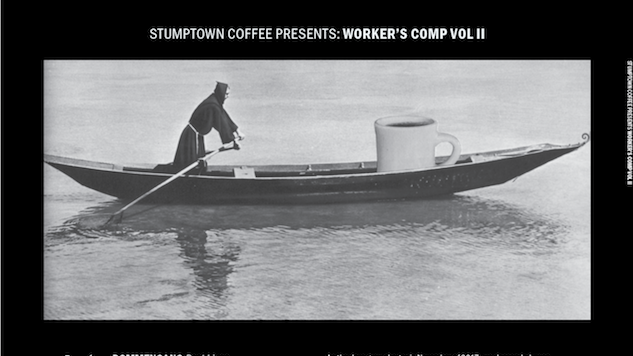 The full compilation will be available online and in Stumptown shops on May 25th.